The Trigger block adds an external signal to control the execution of a subsystem or a model. To enable this functionality, add this block to a Subsystem block or at the root level of a model that is referenced in a Model block. Once at each time step, when the value of the control signal changes in a way that you specify. Multiple times during a time step, when the control signal is a function-call event from a Stateflow® chart, Function-Call Generator block, or S-Function block. Control signal (trigger or function-call) attached externally to the outside of an Subsystem block or a Model block that is passed to the inside of the block. To enable this port, select Show output port. Select the type of control signal that executes a subsystem or model. Trigger execution of subsystem or model when the control signal rises from a negative or zero value to a positive value. If the initial value is negative, a rising signal to zero triggers execution. Trigger execution of subsystem or model when the control signal falls from a positive or a zero value to a negative value. If the initial value is positive, a falling signal to zero triggers execution. Trigger execution of subsystem or model when the control signal is either rising or falling. Execute subsystem or model when the control signal receives a function-call event from a Stateflow chart, Function-Call Generator block, or an S-function block. Create a Simulink Function block by configuring a Subsystem block that is callable with arguments from a function caller. Configure a Subsystem block as a Simulink Function block. The Trigger block must reside within the subsystem. You can edit the function prototype that displays on the block face to specify input and output arguments for the block. To display and enable this parameter, select function-call from the Trigger type list. Specify the function name for a Simulink Function block. Alternatively, you can specify the name by editing the function prototype on the face of the block. Default name for a Simulink Function block. 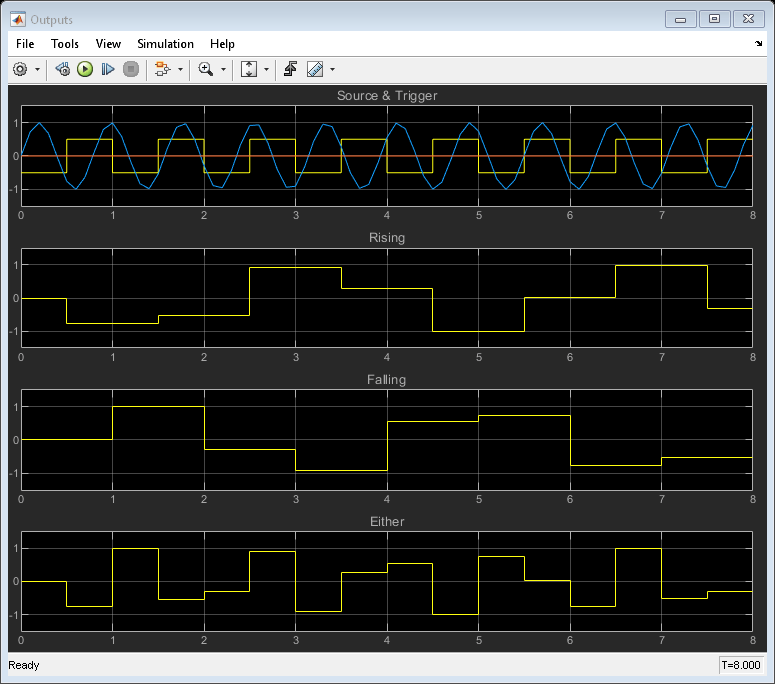 Function name that displays on the face of a Simulink Function block. To display and enable this parameter, select function-call from the Trigger type list and select the Treat as a Simulink Function check box. Control activating the variant control (condition) defined with the Variant Control parameter. Deactivate variant control of subsystem. Enables the Variant control parameter. Displays a variant badge on the face of the block indicating variant conditions are enabled. To display and enable this parameter, select function-call from the Trigger type list and select the Treat as a Simulink Function check box.. Default value for variant control. Inherits the variant condition from the corresponding Function Caller blocks in the model. When Variant Control is set as (inherit) the value for Generate preprocessor conditionals is inherited automatically from the Function Caller block in the model. To display and enable this parameter, select function-call from the Trigger type list, select the Treat as a Simulink Function check box and then select the Enable variant condition check box. Control enclosing variant choices within C preprocessor conditional statements. Do not enclose variant choices within C preprocessor conditional statements. When generating code for an ERT target, enclose variant choices within C preprocessor conditional statements (#if). To display and enable this parameter, select the Enable variant condition check box. Select scope of Simulink Function block within subsystem or model. Hierarchic level containing the Simulink Function block and levels below. One hierarchical level above with qualification. 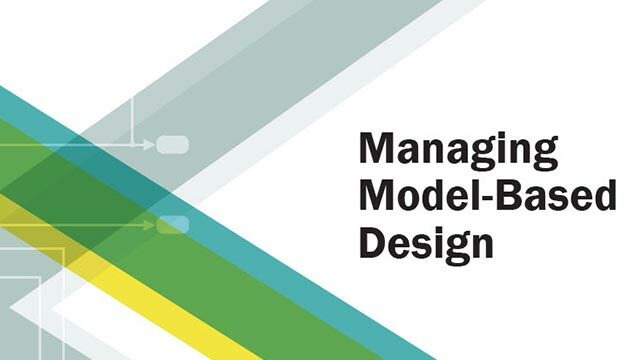 Function accessible from any part of the model hierarchy. To display and enable this parameter, select function-call from the Trigger type list and then select the Treat as a Simulink Function check box.. Select how to set block state values when the subsystem or model is disabled. Leave the block states at their current values. Reset the block state values. Use the held or reset setting from the parent subsystem initiating the function-call. If the parent of the initiator is the model root, the inherited setting is held. If the trigger has multiple initiators, set the parents of all initiators to either held or reset. To enable this parameter, select function-call from the Trigger Type list. The function-call subsystem resides in an enabled subsystem. In this case, the model enables and disables the function-call subsystem along with the parent subsystem. The function-call initiator that controls the function-call subsystem resides in an enabled subsystem. In this case, the model enables and disables the function-call subsystem along with the enabled subsystem containing the function-call initiator. The function-call initiator is a Stateflow event bound to a particular state. See Control Function-Call Subsystems by Using bind Actions (Stateflow). The function-call initiator is an S-function that explicitly enables and disables the function-call subsystem. See ssEnableSystemWithTid for an example. Select when to propagate variable-size signals. Propagate variable-size signals when executing a Subsystem block or Model block containing an Enable port, Trigger port with Trigger type set to function- call, or Action Port block. When you select this option, sample time must be periodic. To display and enable this parameter for a Trigger port block, select Function-call from the Trigger type list. Control display of an output port for a signal that identifies the trigger signal or function-call event signal. Select output port data type for the signal that identifies the trigger signal or function-call event signal. Data type is the same as the port connected to the output. To enable this parameter, select the Show output port check box. The Trigger block ignores the Data type override setting for the Fixed-Point Tool. 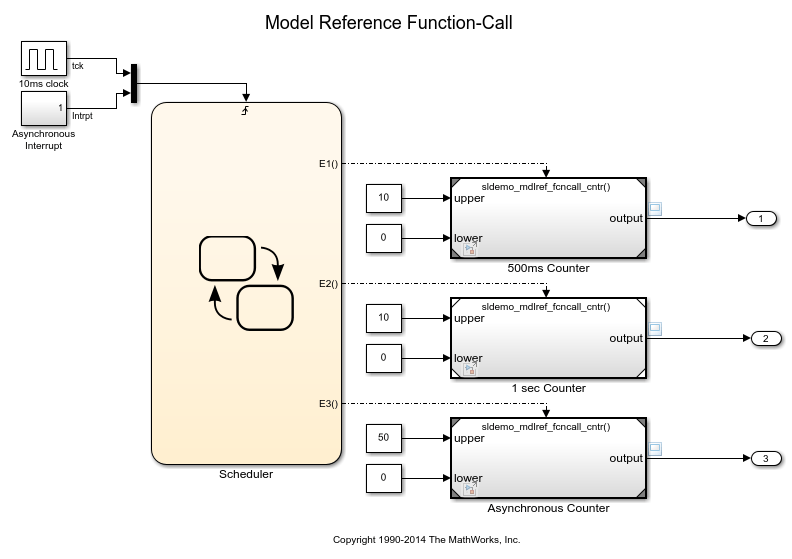 Select the calling rate for a subsystem or model. Apply to applications that do not have a periodic function-call frequency. Apply if the caller of the parent function-call subsystem calls the subsystem once per time step when the subsystem is active (enabled). A Stateflow chart is an example of a caller. Specify the time interval between function calls to a subsystem or model containing this Trigger port block. If the actual calling rate for the subsystem or model differs from the time interval this parameter specifies, Simulink® displays an error. Inherit time interval from the control signal. To enable this parameter, select function-call from the Trigger type list and periodic from the Sample time type list. To enable this parameter, select rising, falling, or either from the Trigger type list. Select the initial state of the trigger control signal. No trigger at the first evaluation of trigger signal. If you choose this option and the Trigger block is in a subsystem where the states are reset, the block does not reset. Zero. Helps to evaluate a rising or falling trigger signal at the first time step. Positive value. Helps to evaluate a falling trigger signal at the first time step. Negative value. Helps to evaluate a rising trigger signal at the first time step. To display and activate this parameter, select rising, falling, or either from the Trigger type list. Specify dimensions for the trigger signal attached externally a Model block and passed to the inside of the block. To display and enable this parameter for a Trigger port block at the root-level of a model, select rising, falling, or either from the Trigger type list. 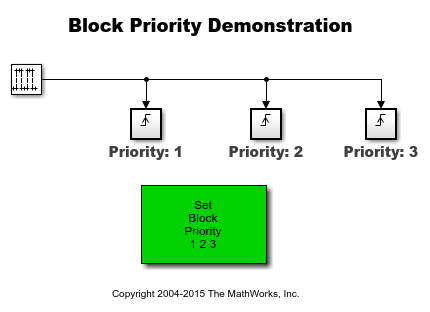 Specify time interval between block method executions for the block driving the trigger signal. Specify minimum value for the trigger signal attached externally to a Model block and passed to the inside of the block. Specify maximum value for the trigger signal attached externally to a Model block and passed to the inside of the block. Select data type for the trigger signal attached externally to a Model block and passed to the inside of the block. To enable this parameter, select the Show data type assistant button . Control how missing workspace data is estimated when loading data from the MATLAB® workspace. For more information about HDL code generation, see Trigger.